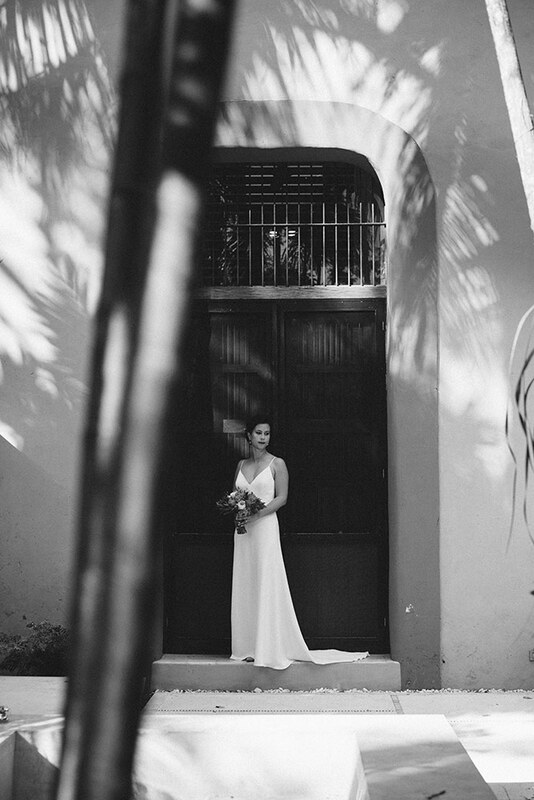 Sarah and Jason's wedding was at Hacienda Sac Chich and Casa Sisal, Yucatan, Mexico. For a while now I have been longing to photograph a wedding here at Hacienda Sac Chich. I had come across it a few times and had received several enquires about photographing weddings here in 2017, none of which I could do due to previous wedding bookings. So, I was delighted when finally an enquiry came in for a wedding here that I could do. 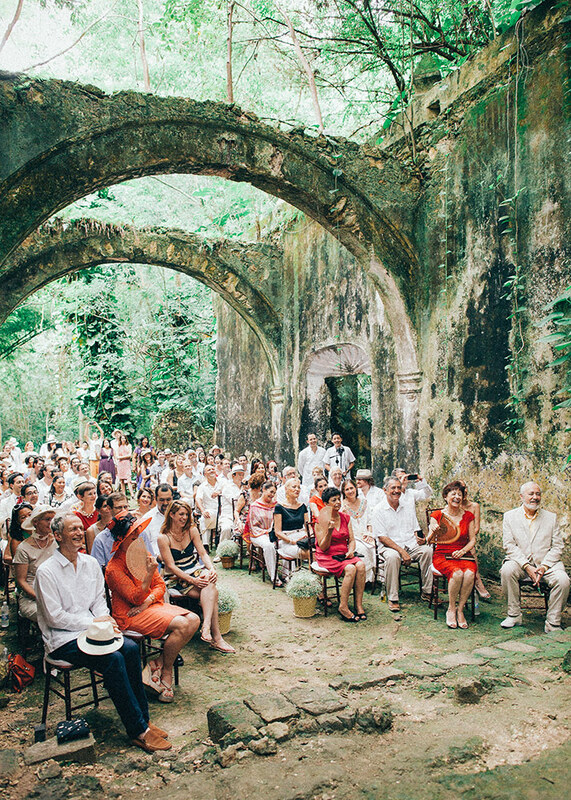 I honestly think it is one of the most gorgeous wedding locations in Yucatan and actually the whole of Mexico. The two properties, the hacienda itself and the modern Casa Sisal, have such a unique architectural interplay and balance between them. The hacienda has beautiful brightly painted walls and a central shady inside/outside (ie it has no walls!) area that makes such a fresh and cool core to the hacienda. It is the perfect place for an intimate wedding with its various areas, small patios, courtyards, gardens and pools etc. There is one main stretch of open lawn between the two houses, long and elegant and majestically lined by royal palms, giving a feeling of space and open sky beyond the shade and cool of the hacienda's gardens. Sarah and Jason were still deciding on where to have the ceremony when I arrived to look around and take some relaxed shots of them the day before. We decided on an area of grass between the two arms of the hacienda. I wandered around with them and took some photographs around the two properties. The following day, the wedding day had two sections, the first part was a small and very informal tea ceremony in Casa Sisal which was much enjoyed by the children of the party. Sarah then changed into her wedding dress and we took some photographs of her and then her and Jason before the guests began to arrive. Amazingly and totally out of season, there was an intense rain shower literally just as the ceremony was suppose to begin. I thought I was imagining it when I heard the noise on the roof. But Sarah's family were not surprised, apparently this same thing happened at both her sisters's weddings and so now it is a family tradition! I don't even know where to start with this wedding. It was like nothing I've ever seen before. 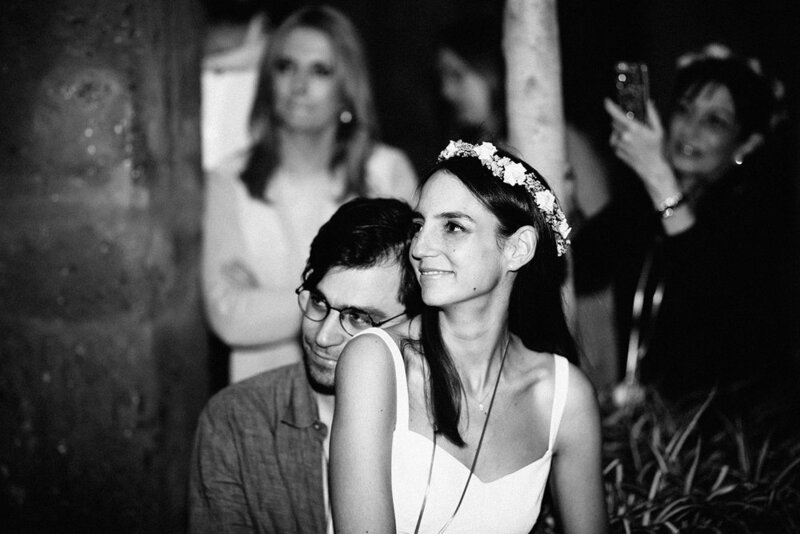 The bride and groom (who are friends of friends in Mexico City) had been to this ranch several times for riding and weekend trips and had fallen in love with the place. It really is such a unique and stunning spot. The open plains that surrounded it and so peaceful yet so majestic. The entire day, including the preparations, ceremony and party, was just so laid back. The ceremony area had been laid out with a circle of petals and hay bails draped in blankets for the guests to sit on. Horses and mariachis announced the bride´s arrival with her father and the ceremony was given by a great friend of the couples', interspersed with readings and speeches by other friends and family members. 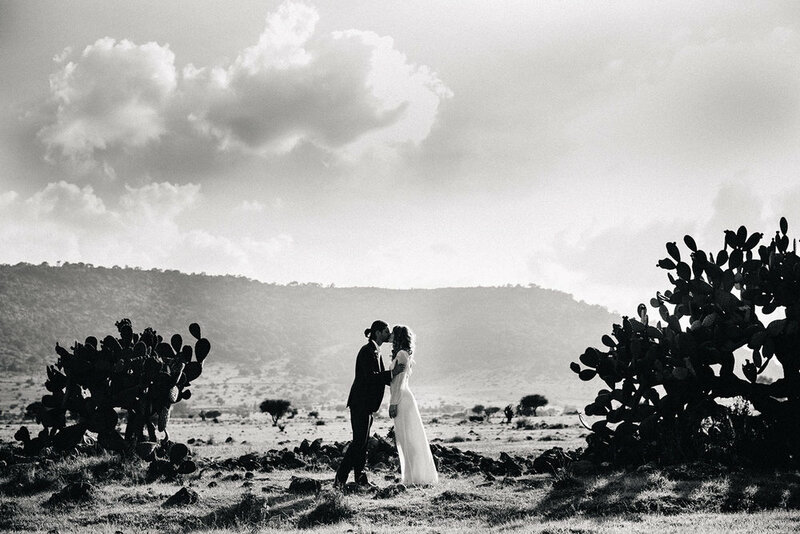 After the ceremony ended and the guests made their way back to the main rancho buildings for drinks, I stayed out on the plains with the bride and groom to take some photographs within the beautiful surroundings. They were so spontaneous in their happiness and we got such wonderful photographs. The speeches were moving and funny and I just about had enough light to shoot with no flash, which I always prefer. I don't see camera noise as a problem as long as it doesn't distract from the images. To get shots that represent the real context and moment as it was rather than introducing artificial light is, in my opinion, almost always better, more evocative and more beautiful. 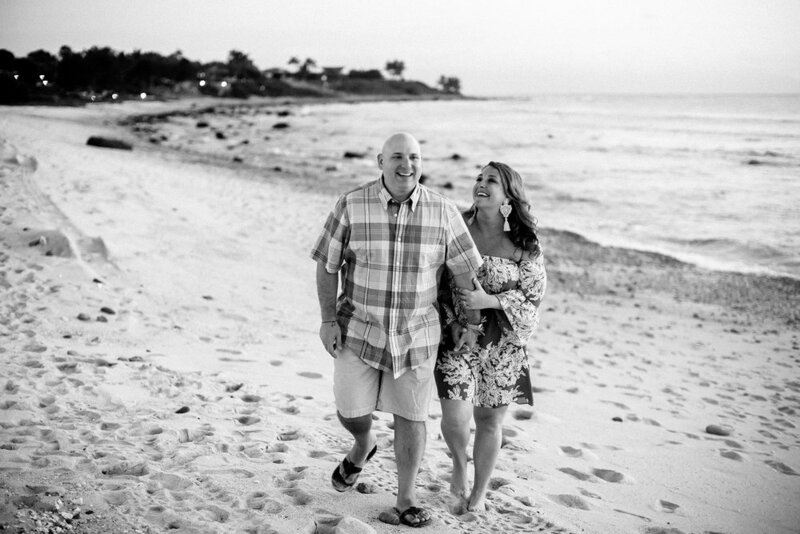 This couple were unbelievable amounts of fun to photograph. Their wedding was the sweetest most loveliest thing ever. They were all staying with a bunch of friends and family in Casa San Miguel, a perfect private rental house and it is there that they had their wedding ceremony on the roof under a pergola. Joey's dad gave the wedding ceremony an Joey got out his guitar and sang a song, it was just perfect. After the ceremony I went for a little outing with just them two to take some photographs around the centre of town. I suggested we take a taxi and ask him to accompany us, waiting to take us to the next stop. I did think that maybe I would get some nice shots of them in the back but it was all better than I had imagined, the cab driver Oscar even featured in the photographs! They played around and had fun in front of the camera at every moment, I did not stop pressing the shutter for more than a few seconds at a time. I had several spots in mind but the bride, being a designer, spotted a couple of doorways she liked and we added to what I had planned. I couldn't kept on shooting forever but we managed to tie it all up in half an hour or so, I think, maybe we ran a little late I'm not sure, I completely lost track of time. We headed back to the house where everyone was ready and waiting for the callejoneada, including the mariachis and mojigangas dressed up to look like Kim and Joey. Things then got even more fun during the procession, as you will see from the photos! 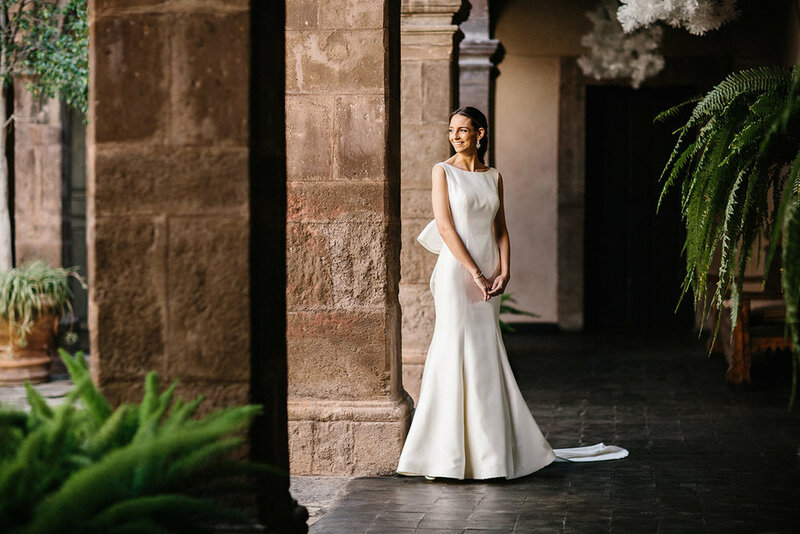 I had photographed Aranza's wedding in San Miguel de Allende a couple years before I got her email saying that she was pregnant and would like some elegant simple pregnancy portraits. She couldn't not have been clearer that she wanted "nada cursi" (nothing cheesy) and that is why she had come back to me, because she knew my style and trusted me completely to fulfill this wish. I tend not to do pregnancy shoots as I do think it is very hard to not be cheesy at all but on this occasion I said yes because we were definitely on the same page. It was such a nice process, she came to my studio one Sunday morning and we just slowly moved around trying out different spots and different lighting. I almost only use natural light so, the varying lighting was with my two layers of curtains that I use to filter and direct the sun from the full wall windows. I am really looking forward to my next maternity shoot now, I loved it, so peaceful, so different from photographing a wedding! I had never been to Mallorca before so was pretty please when I first got the email about this wedding. Cap Rocat is even more stunning than I had visualised. It is vast and the echoing sounds of the sea are just audible from within the fortress. The colour of the stone is like nothing I have seen before and holds the warmth of the sun, becoming pinker as the evening approaches. 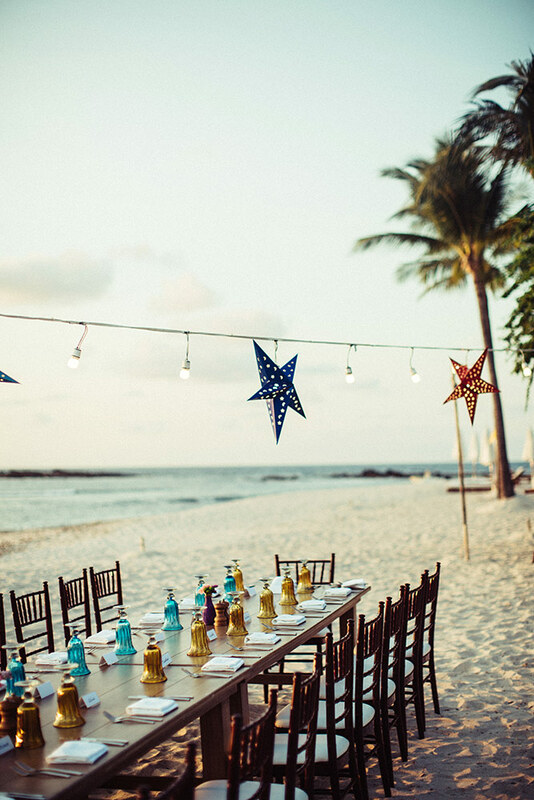 Despite it's apparent elegance, this wedding was extremely laid back. The bride was gorgeous in Alexander MacQueen and a simple floral wreath. Their lovely baby son was present throughout the day, behaving himself perfectly on Martijn's lap during the ceremony. After nightfall, masks were handed out and the wedding guests descended into a very cool stone dungeon type space where one of the couples' friends was ready at the turn tables. 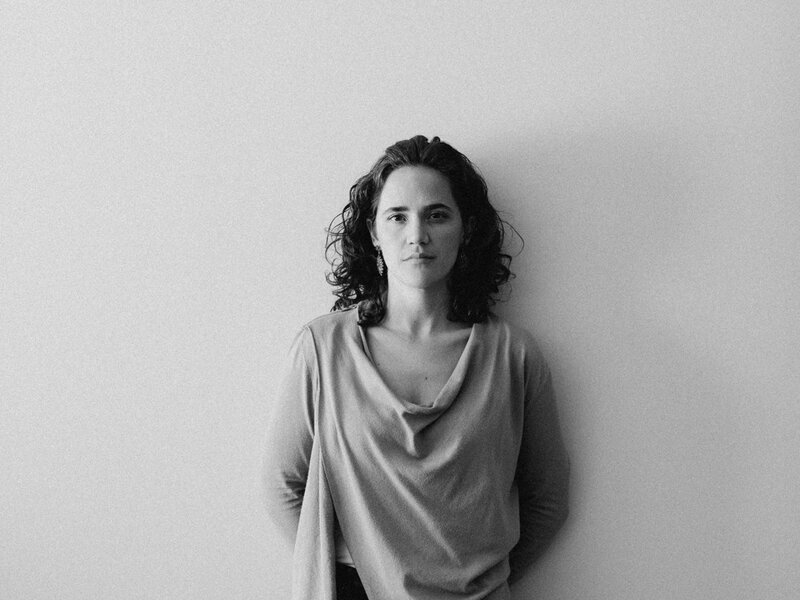 Medium format portraits of the artist Ana Noble and the photographer Stefan Wigand. I took these portraits on my medium format Mamiya. Of course my cat managed to muscle himself into a few shots. This was not the plan. I knew Ana would be an amazing subject, she is so statuesque as well as obviously being exceptionally beautiful. But more than anything, I knew that she would let me direct her and Stefan (who is incidentally also a professional photographer) freely to get the images I was after. Trust can sometimes be key to the process of portraiture, trust or letting oneself go. Although not always, tension, discomfort and resistance can also be interesting and meaningful companions. This couple contacted me with their story. 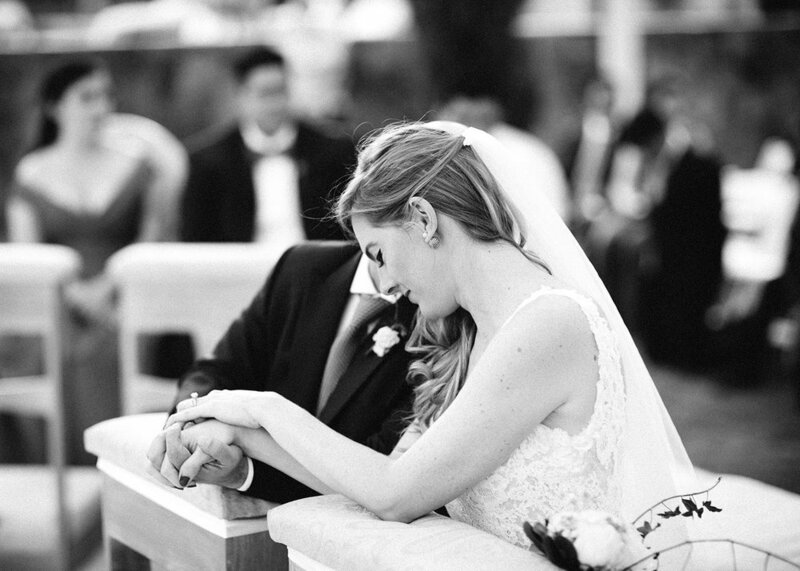 They had been thoroughly disappointed with their wedding photographs ten years ago and wanted to take this opportunity, on their tenth wedding anniversary and celebration visit to San Miguel de Allende, to get the beautiful photographs they hoped for the first time. They wanted photographs that showed not only their love but that also reflected who they were as individuals and as a couple. I was given great guidance as to the style of images they wanted, "light, bright, full of movement and fun". I was (as usual) keen to get the evening light at its various stages. We started off at the Rosewood hotel where they were staying, using several pretty shaded spots to get some of the more formal images first. We then (after a change of outfit for Liliana) went out to the streets around Parque Juarez shot some more fun walking shots - Liliana had brought a gorgeous paper bouquet of flowers earlier that day) - some with the Parróquia as a backdrop. Then was the part I was really excited about it, we went up to El Charco del Ingenio (the botanical gardens of San Miguel) to take some photographs there at the golden hour. It is one of my favourite places in San Miguel and perhaps in the whole of Mexico. The evening light seems to hit the dry yellow grasses and rocks in such a warm and magical way. Due some some unavoidable logistical difficulties trying to get into the garden, we lost tons of time so my hour was cut down to around fifteen or twenty minutes but we raced around and got some lovely shots, especially of Liliana down on the dry river bed. I was so so happy and so were they. Casa Hyder is a private house and has been featured in Vogue. This was a brilliantly fun group of people and they enjoyed every second of the wedding. 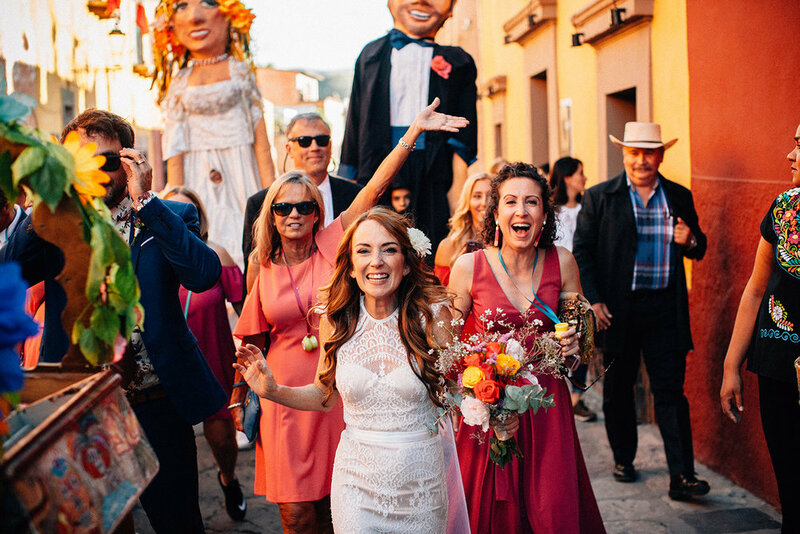 The ceremony was at the stunning Parroquia, San Miguel's iconic pink church situated just off the equally iconic jardín, right in the centre of the old part of town. After briefly holding an immaculate pose with the mariachis just outside the church, the bride and groom lead the callejoneada through the cobbled streets and passageways to the exquisite and shady Casa Hyder, where cocktails were awaiting the guests. The bride and groom were constantly beaming, only pausing for many photogenic kisses. The speeches were moving, tears of joy were shed by all, and the dancing was intense and long lasting, it was a perfect wedding. 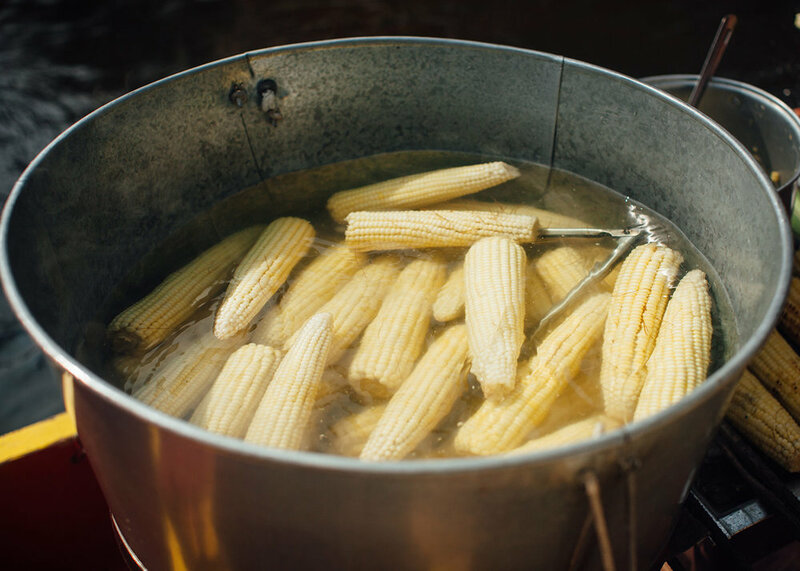 It is unheard of to arrive at Hacienda Uayamon and be to not immediately be enchanted by the place; the humid smell and dense sound emanating from the humidity around one is dizzying, in a good way. It really does have an otherworldly atmosphere. I had previously been to several of 'The Haciendas' photographing for a magazine and had immediately felt the separateness and uniqueness of Uayamon. The Mexican bride Marusia, had met her Dutch husband it China and they had individually and together gathered up friends during their itinerant lives from all over the globe. They had been on a visit to Yucatan and the Campeche on one of Diede's first visits to Mexico and they both adored the place. Their wedding ceremony, held in the roofless chapel nestled amongst the foliage and encroaching jungle. So the day after the civil wedding and callejoneada, also in the Rosewood, this couple began their preparations for the main wedding. The alter and ceremony set up were in the garden at the very back of the main gardens beside the hotel and of course, it all looked beautiful under the reliable sun of San Miguel. We had a small time to take family and couple photographs in other parts of the grounds and then straight to the party in the large area to the side of the main building, under a tent and looking out to the San Miguel skyline with the steeple of the Parroquia in view. The Rosewood really is such a beautiful place for a wedding. The dances were, like everything else at these wedding events full of tangible joy and happiness. The bride had one dance with her young daughter as well as the usual first dance with her new husband and with her father. I thought this was such a moving and sweet touch. This joy filled afternoon started in the Rosewood with this happy couple's intimate and simple civil wedding ceremony. They were surrounded by family and close friends from all over the world it seemed, and you could just feel the happiness that everyone felt for them, let alone the happiness that the actual couple felt, which was palpable and visible in every shot I took. The ceremony was followed by a short cocktail part on the balcony light up by the warmest orange light of sunset. We then all headed down the street to start the street procession, caballitos of mescal in hand and mojigangas and donkey ready. 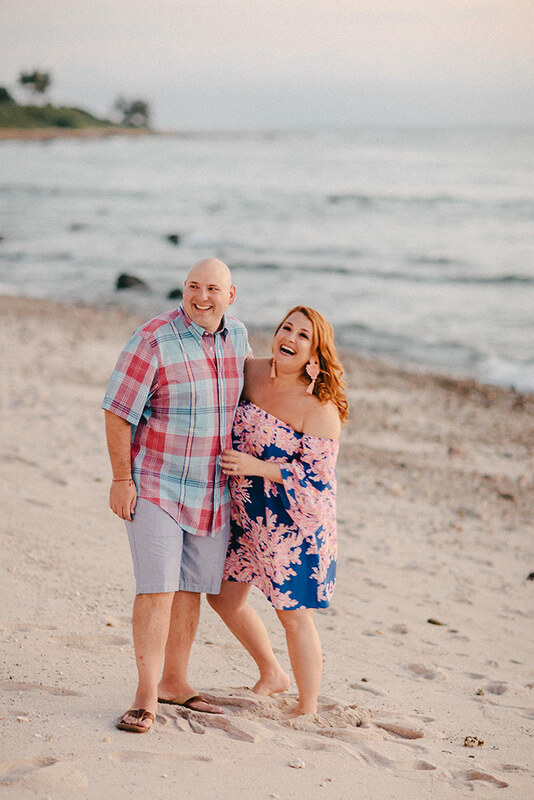 From the first time I spoke to this couple they made it clear that they wanted me to be able to have creative freedom with their wedding photographs and their engagement portraits. They had both seen my non.wedding portrait work and loved it. It is not so common that a couple want me to take this unconventional style of portraits for their engagement shoot so it was a unique experience for me to be able to do so. 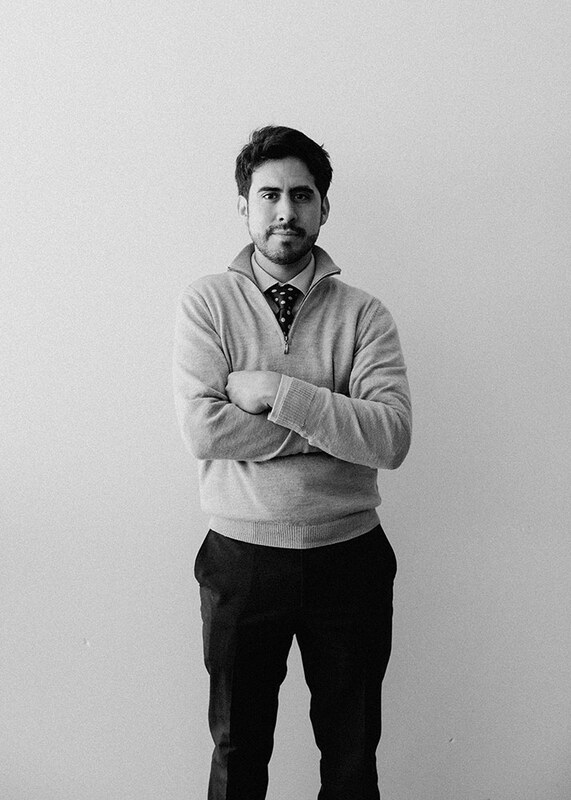 They came to my studio in Mexico City and they were incredibly enjoyable people to photograph. It was a very calm and quiet process and I knew half way through that I was going to be very happy with the results. I am happy to said that they loved their photographs too. This was a delightful English spring wedding with a middle-eastern touch! I knew the groom from my days at boarding school in Dorset, just down the road from his family home, where this wedding took place. I was somewhat hesitant to return to that part of world, not have the greatest of memories from that era. But I do love an English country wedding (only when they are in the spring or the summer, please note!) and I know this one was going to be really lovely. It's quite rare that I shoot weddings in my home country now and so I was also keen on a nostalgic note, and to touch base with the (very different) cultural norms, behaviours and expectations of a wedding photographer in England. This couple didn't really want any posed shots at all, something that I remember is really quite common in the UK but almost unheard of for my destination and Mexican weddings. I got back in English wedding photographer mode and think I managed to do a pretty good job. They loved their photographs so it all ended well! The day after the callejoneada and drinks party the night before, I headed back to the same elegant house where the welcome party was held, to photograph the bride's preparations as well as to take some formal portraits of her and her family. The house, as you can see from the image of the parroquia visible from the open courtyard, is smack bang in the centre. It is the bride's grandmother's house and so of huge personal significance to her. The preparations were calm and peaceful, Sofia had her make-up and hair done in the cool of one of the shady passageways around the main courtyard, in the open air. I do sometimes do a double take at moments like these, realising in an instant how mesmerically beautiful life can be in a warm, blue-skied and picturesque country like Mexico. In the late afternoon we headed off down the road to the Instituto Allende where the ketubah was going to be signed, followed by the ceremony in a small terrace at the back overlooking the city, then by the reception and party back in the main courtyard. The mazel tov dancing part was amazing as usual, bride and groom being thrown in the air and somehow nobody getting hurt, am always impressed by this. I had photographed the wedding of the sister of this groom exactly a year beforehand and was happy to be back photographing this lovely and extremely fun family and group of friends. 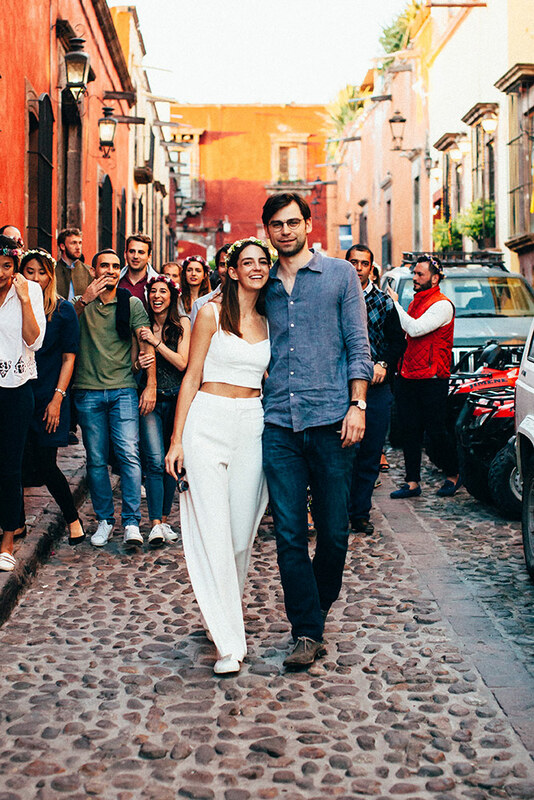 This time the wedding was to be in San Miguel de Allende rather than Mexico City though. This welcome drinks party was to be held at the bride's grandmother's stunning house in the centre of San Miguel, where the bride had spent many happy weekends and holidays as throughout her life. I met the couple there before going out for a very short walk on the streets around the house to take some photographs of them together, before the rush and formality of the wedding the following day. The drinks party was full of loving speeches about the bride and groom which is always one of my favourite parts of any wedding events I shoot, learning snippets about the lives and past lives of these people with whom I am becoming so familiar through the viewfinder. It never fails to move me to get a glimpse into how much the couple whose wedding I am photographing are loved by the people that surround them on this very special occasion. I not one to often say yes to 'corporate head shots' but made an exception this time for one of my best friends' boyfriend's startup. It was a surprisingly painless experience, being as they all were, exceptionally photogenic subjects. I think the results serve for what they needed and I actually quite like some of them as portraits as well! Happy to say that they were really pleased as well. The moment for the main wedding ceremony and party finally arrived! After three days of pre-wedding celebrations and drunken fun, one would have thought that this crowd might have been, well, a little calmer for the main event. Nope. Not the case. This wedding was gorgeous and once again, a mega fun party. I started off photographed the bride in her handsome family home, getting ready with her parents, brother and sister-in-law. We then headed to the historic centre of Mexico City and to the Ex Convento de San Hipólito where the wedding ceremony and reception were to be held. The whole place was light up with hanging bulbs and candles, it was beautiful. San Hipólito is a majestic ex convent built with the classic colonial form of one open air courtyard surrounded by cloisters on ground and upper levels. The chuppah was in one of the upper cloister corners with the guests spreading out down two sides of the square. The groom cried and the whole thing was very moving. Soon after this the party and mazel tov began, including the usual being lifted up on chairs and being thrown into the air on a sheet. But there were some extra shenanigans that I've never witnessed before, such as a group of men lying down side by side on the ground and the groom having to take a running jump over the whole row. I was terrified for that last man. But the groom made it. And they all lived happily (and hungoverly) ever after. Take a group of Mexicans, combine them with a group of Brits, feed them several bottles of mescal and several more bottles of beer, and put them in a boat on a canal the day before the wedding. And all to the sound of live mariachis and sing alongs. Yes it was pretty fun, and yes the groom fell into the water. He lived to tell the tale and to marry the love of his life the following evening. I have truly never seen such fun being had as I did at this couple's wedding events. It felt as though they were the first of their group of friends to get married and everyone was over the moon for them. Actually, international weddings (I specifically mean 'bi-national' or 'bi-cultural' rather than simply destination weddings) often end up being extra fun due to that excitement of celebrating with a new mixture of cultural rituals, as well as the feeling that you can literally see each individuals' cultural and geographical universes expanding with the union. 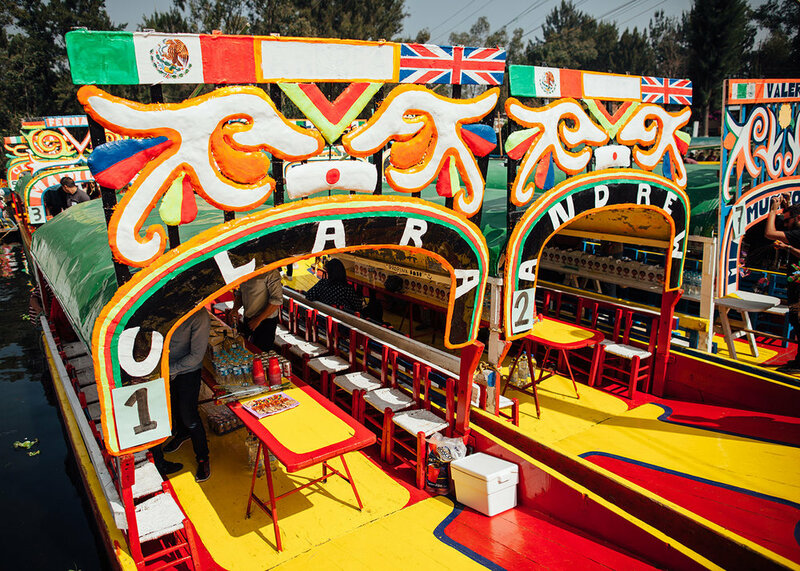 If you ever come to Mexico City and you fancy some random drinking, eating and singing on a painted canal barge, Xochimilco is for you. Some people call it cheesy. I call it brilliant. So many colours, so much booze, so much fun. This was the pre-wedding rehearsal dinner held at the hotel where the whole wedding party were staying, the St. Regis Punta Mita, an immaculate and blissfully tranquil hotel near the the small fishing village of Punta de Mita which lies about half an hour's drive from Puerto Vallarta. I arrived at the resort and was driven in a golf cart to the beach where the rehearsal dinner was being laid out on the sand. It looked absolutely gorgeous, so inviting, I could just imagine how heavenly a sight it was going to be for everyone who had recently arrived after a tiring day in aeroplanes and airports. We had (literally) a couple of minutes of sunlight left to take a couple of informal beach shots of the bride with her sisters and then bride and groom before the light faded for the night. This bride originally contacted me from Texas saying that her sister, who is a professional photographer (I later discovered that she is quite a renowned one!) had selected me out of a group of wedding photographers that she had given her. I was pretty flattered. Although I've photographed several photographers' weddings before and it is always pretty self-conscious making knowing that you are being watched by someone in the know. We all have our different methods, ways, habits and tricks, and I just always hope that even if mine differ from the ones of the photographer watching me, that they have their total trust in me. And on this occasion, this was the case.